2nd time that I’m working with the “sparkjump“, after we did DISTRUZIONE DI ADAMO, 2011 in Bari. The site for the commissioned work to be developed is an entrée to an office/residential building in Bregenz, Austria, which can be entered twice in an L-shape – once through the “small main entrance” at the front side of the building, once through the “large side entrance” at the parking side. The current room atmosphere is characterized by a neutral, rather cold and anonymous character that doesn’t seem very inviting. The different grey and shady white tones of the room elements reinforce this impression. Only the somewhat lonely potted plant gives cause for quiet joy. This mood was the first thing that aroused the question, which image volume, which content and which materiality I could oppose so that the visitor could feel welcome. Spontaneously I thought of a greeting, a large greeting image, or an “encounter-image“, which is the prerequisite for every greeting. Reflecting on this, I came (again) across one of the most famous details of the entire history of art – the central detail of the “Creazione di Adamo” by Michelangelo Buonarroti, in the ceiling fresco of the Sistine chapel in Rome. On the images on the left I have simulated these two hands as simple black and white stained, thick lines – on the right the light hand, as the daylight coming from the window/outside, and on the left the shadow hand, coming from the inner and shady side. 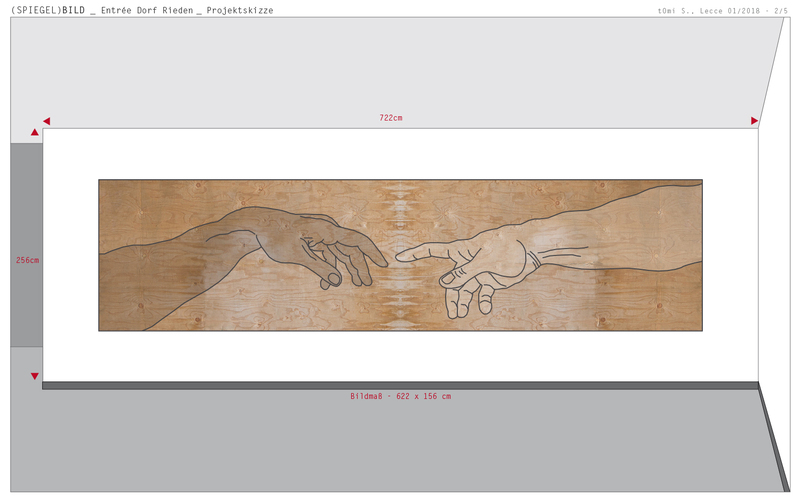 The way I want to “materialize” these hands is still open, but the crystal-clear line drawing on a bare wooden structure is definite. 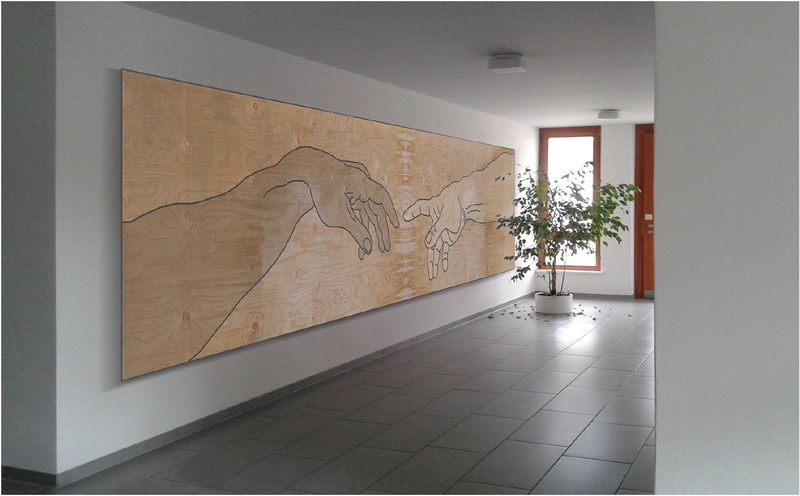 I will use two sequent and mirrored birch plywoods which, similar to the simulation on the left, are showing a butterfly effect respectively are reflecting the gesture of the hands in the wooden structure (622 x 156cm). As a reflection of the reflection of this gesture I want to add on the left wall of the side entrance, a mirror (Spiegel) in the same proportion (228 x 64cm). This mirror brings some more daylight in and makes the visitor a part of the work. Because standing in front of the mirror, (s)he has the Bild (image) in background and thus becomes the focus of the idea: the living cause why there’s an image and a mirror of an encounter. The plant will get a larger, rough, conical clay pot. More information and images of the realized work in the – i hope – near future.